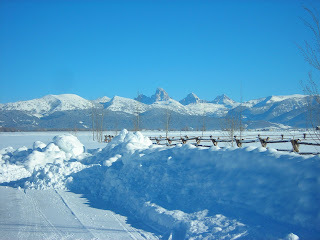 We had a couple of brilliant blue days here in Teton Valley last week, accompanied by below-zero temperatures. It was pretty to look at, but you needed to dress like an Eskimo to enjoy it. 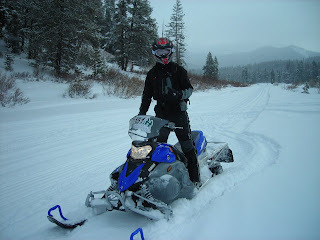 It's been a cold winter already, even by Idaho standards. Business took me to Logan and Salt Lake towards the end of the week. The window between storms was narrow, so I had to pounce while the roads were open. Turns out that was a wise move. 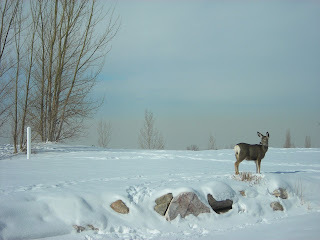 They're having a big winter in Utah, too, and the deer are now wantonly grazing in subdivisions that used to be fields. 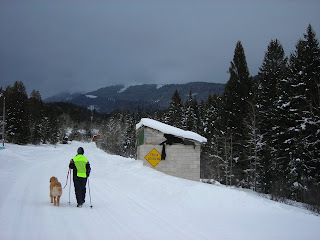 Since returning to Driggs Saturday evening, the roads in and out have been closed almost constantly. 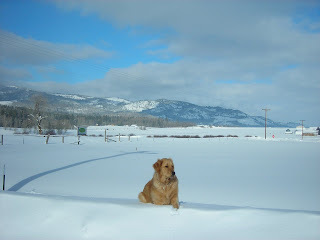 Teton Valley has effectively been "snowed in." 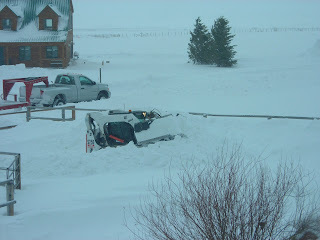 We haven't had mail delivery since Saturday, and were snowed in our own house for a couple of days. 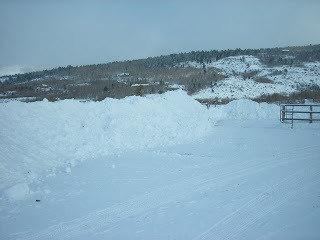 Snowdrifts four feet deep and fifty feet long were too much for the snow blower, so when the winds finally subsided this morning we hired a bobcat to clear our driveway. It was nice to leave the house after three days! It's amazing how quickly the focus of a mountain community can move from "recreation" to "survival." 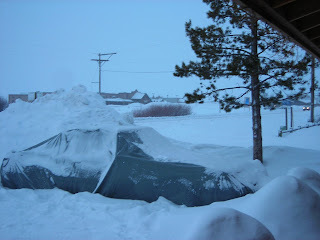 Primary concerns shift from skiing and snowmobiling to heat, food, water, supplies and not driving into a snow-filled ditch. The winds were so bad yesterday that a long-time local became disoriented just walking from his house to his nearby barn, and was lost for three hours. Kind of sobering, and reminds me a bit of Jack Nicholson in "The Shining." I'm becoming a believer in the addage "be careful what you wish for." 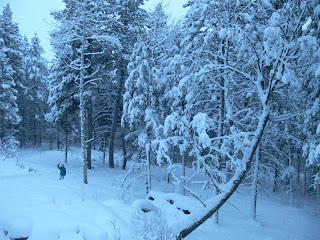 We've prayed for snow like this for years, and it's arriving like it's making up for lost time. As of tonight, storms are still lined up as far as the satellites can see. 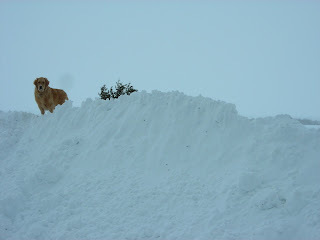 We'd like a break, but Bridger doesn't mind...he prefers the vantage points from atop growing snowbanks. ...to this, within a matter of hours. The difference between January life in Tucson, Arizona and January life in Driggs, Idaho is so incredibly huge, you wonder how they can possibly be on the same planet. But, the human capacity to adapt never ceases to amaze me. 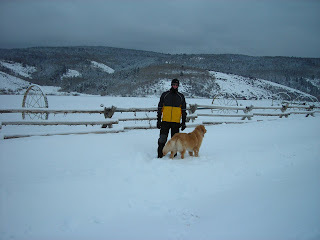 I'm already re-accustomed to the Teton Valley winter life of snow, cold, gray and ice. It took a few days for the blood to thicken up and the eyes to differentiate between clouds, snow, and road, but I think I'm there now. I often wonder how the natives and early settlers did it in places like this, with fire and blankets their only sources of heat. Those would have been some endless winters. When I was trudging around Denmark half a lifetime ago, fighting below-zero temperatures and humidity with constant wind, I would similarly wonder why the Vikings ever came back from their journeys south. I guess it just proves that home is where the heart is. It was a heavy work week, making up for time spent away over the holidays. 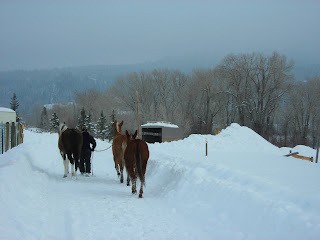 So, outings were short but sweet: walking the dog, a snow bike ride on packed county roads, snowshoeing up ridgelines in bottomless powder, moving horses from the pasture to the house, and shoveling (uggh). 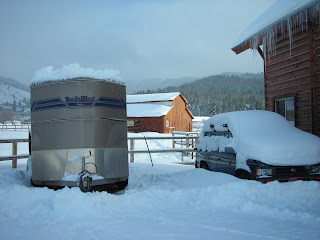 It's probably been five years since we had snow like this in Teton Valley, and it's awesome all the way around. 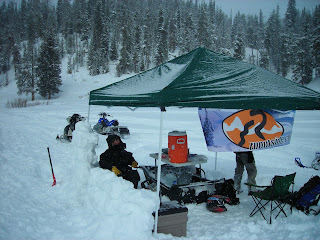 Great for winter recreation, and great for summer irrigation needs. Bridger was glad I finally stopped. 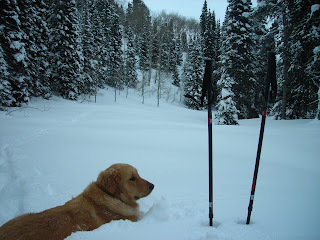 The snow was waist-deep...I think I actually made him tired this weekend! Moving the horses took nearly all day Sunday, but Joanne's glad to have it done and it'll be nice having them up by the house again. As I mentioned, we have a little snow around here now. There's no sign of it melting and another storm is moving in Tuesday, so might as well enjoy it. 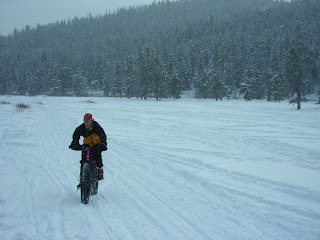 Next weekend: snowmobiling and snow biking at Togwotee...can't wait! First of all, Happy New Year! I hope you all had a great Christmas and New Year's. It's been a couple of weeks since my last entry (sorry), but you know how it goes during the holidays. One get-together leads to another, one family visit to another...not to mention in-laws and traveling. Good times and good memories. 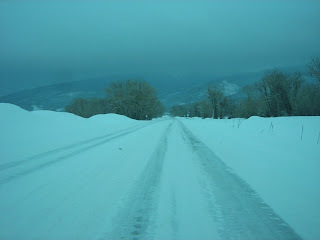 The snow continues to fall here in Driggs, and Teton Valley has been a winter wonderland. My good friend Jere sent me this photo yesterday, his wife Deb waving in the midst of a fresh foot on their driveway over the weekend. A couple more storms are moving in this week, so it should continue piling up. 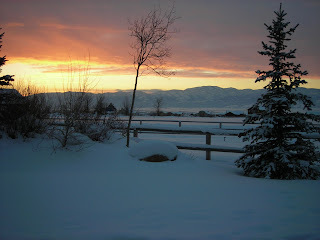 The snow and wind blew us south, first to Salt Lake and a few days with family over Christmas. 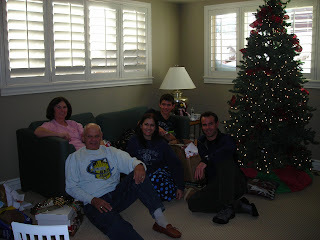 Here's Christmas morning with mom, dad, Lisa and Tyler. It's great to catch up with parents, siblings, cousins and friends over the holidays, especially with people spreading out all over the country these days. Touching base seems to renew a nice sense of groundedness in all of us. 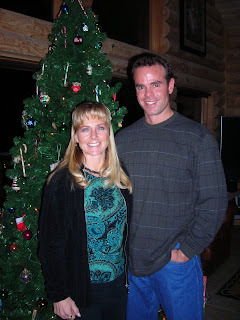 Eventually, we landed in Tucson for New Year's with friends. 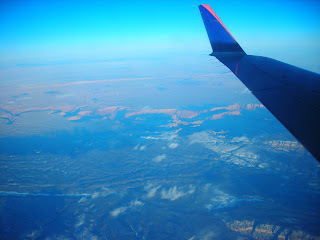 The flight from Salt Lake took us directly over the Grand Canyon, and we managed a few photos. Incredible sight, to say the least. Viewing it reminds you of your very small place in the grand scheme of things. 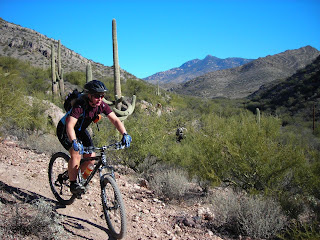 Tucson is quite a contrast from Driggs any time of year, but especially now. Saguaro, Prickly Pear and Ocotillo replace Aspen, Lodgepole and Fir. 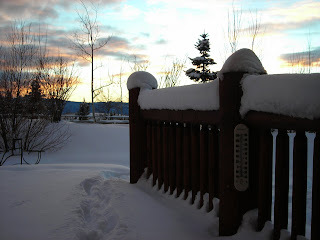 Snow, sleds, skiing and sub-zero temps give way to blue sky, red dirt and green grass. Mountain bikes, hiking shoes and golf clubs beckon. We did our best to spread the love. 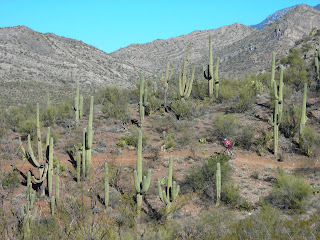 If you ever find yourself in the desert southwest, check out the 800-mile long Arizona Trail. It stretches from the Mexican border in the south to the Utah border in the north. 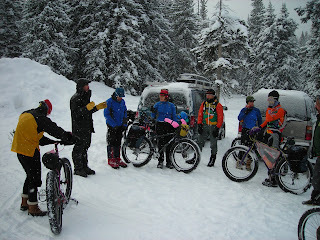 We rode several sections, and it absolutely rocked. Just outside Tucson, a metro area of one-million people, you feel like you're in the middle of nowhere. I love that feeling. 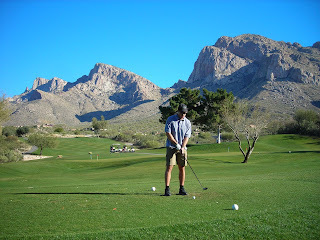 I'm all about fun in the snow, but you quickly get used to 70-degree, bluebird Tucson days. 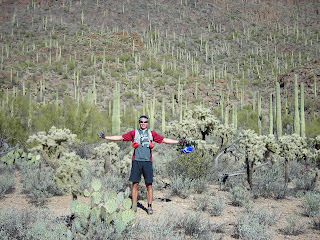 Here I am in Tucson Mountain Park, digging it. 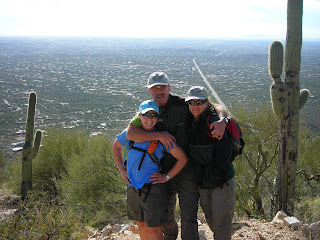 Our good friend John runs an awesome Tucson-based guide service: Southwest Trekking. Hiking, mountain biking, climbing, rafting, adventuring...he'll lead the way, and you'll have fun. 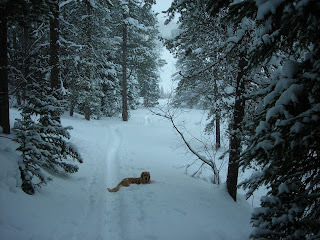 Back in Driggs, looking out at the snow, winter adventures are being planned. I'll keep you posted. In the meantime, Happy 2008!